Whether it's real-time graphics, video editing, or event production, professionals in the broadcasting and media-related industry face similar struggles when it comes to adequate equipment. Computers in this field require both powerful hardware and software, but such high performance usually means one is confined to large desktop systems. They often end up using multiple systems for different tasks. Facing these struggles, many long for a new idea and look for a solution that combines all the qualities that they need in one portable unit. 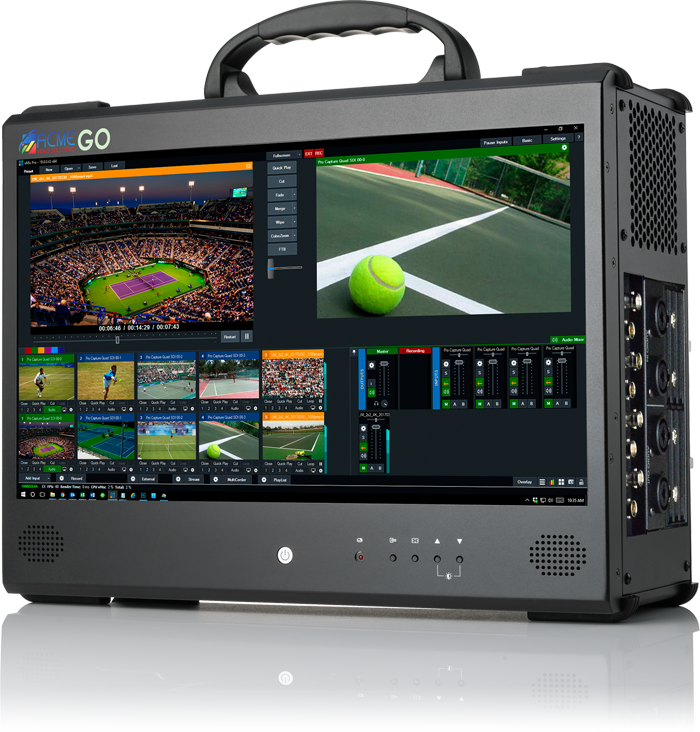 ACME Portable is proud to present the Acme Go, an all-in-one ultra-high-performance portable workstation that has been specifically tailored for each individual in the broadcasting and media industry. The Acme Go offers high-end specifications. It comes with many full-size PCIe expansion slots to integrate your preferred capture card. Its display is an HD true color LCD screen for superior picture quality. This lightweight portable computer is also rugged for use in various types of environment. The low-noise fans with a silent power supply make sure not to impede your work. The aluminium chassis offers up to 2x 5.25" bay option for expansion devices like removable SSD drive bays, camera card readers, LTO tape drives or just additional hard drives. You also have the option to use a customized keyboard with programmable hotkeys to assist you with your favorite editing or broadcasting application.